I probably should have warned you . . . I have a few cat post brewing. They have been swirling around my head. I thought it would be best (for me) to just get them out. You may have seen me mention that we have two cats. You may have also seen me mention that one cat is tiny and the other cat is big. They are actually about the same size, as in, the same length and the same height. And in fact, they are not large cats. I would say they are medium, if not small. The are NOT large. But one is heavier than the other. The heavy one makes us think we should try to have her eat less and the thin one makes us think we should feed her ALL the time. But I think she is comfortably thin. I mean, when I look at her or pick her up, I kinda freak out because she is soooo tiny. She is thin . . . her bones stick out and they knock together when you pick her up . . . but . . . she is in charge of her eating. It is not as if she doesn’t have access to food. She is just a very lean cat. If she had any issues that I notice about moving or toileting, I would be concerned, but she moves like the wind. Just last night I heard my husband make a flabbergasted noise in another room and I asked him what that was about. He proceeded to explain how Nessa, the thin one, just moves like there is no stopping her. It doesn’t matter what is in the way she will get around it, she will jump over it, fly past it, sail under it . . . just MOVE. She moves in very amazing ways so I am confident that she is pretty healthy despite her small frame. But . . . I still try to get her to eat more. I probably have mentioned how I will put the wet food down and Nessa will lap up all the liquid. Then she will go away. Teagan will come in and eat off one plate. Then sometimes she will go away. Then later on Nessa will come back in and eat some. Then Teagan will come back in and sometimes she finishes what is left . . . but sometimes not. It is really difficult to track who eats what. When you try to watch them and monitor them then they don’t eat. So leaving them to their own devises, probably ends up that one eats more than the other. So with that in mind I discovered that Nessa likes one brand of cat food that Teagan does not. In fact, Teagan will only eat one kind that I have purchased so far. Nessa will eat others, but not Teagan. One day Nessa was in licking her empty plate and I thought, “Hmmm. Maybe she will eat these fish flakes I have. (And have had for a long time. )” Oh my word! She gobbled them down. I thought, “Well, I don’t even know if Teagan likes them because Nessa just sucked them down.” So I decided to buy more. Well, Teagan does not like them, but Nessa will gobble them up. She will gobble up a pile then look at me and make her little squeak for more. So I will give her more. Teagan will not touch them, even though they are bascially tuna. So . . . this is another thing that I can feed Nessa and not fear that Teagan will eat it all. But then I feel bad because Teagan asks for something, too. But the whole point it so get more food into Nessa. Anyway . . . I just thought I would share this treat that my one cat considers crack-like. I think they might make us go broke because we are down half a bag already. I thought we had gotten them a while ago, but we just got them Friday. Do you have a treat for your cat that they LOVE? What treats do you give your cat? This entry was posted on October 11, 2017 at 7:07 pm	and is filed under Cats. 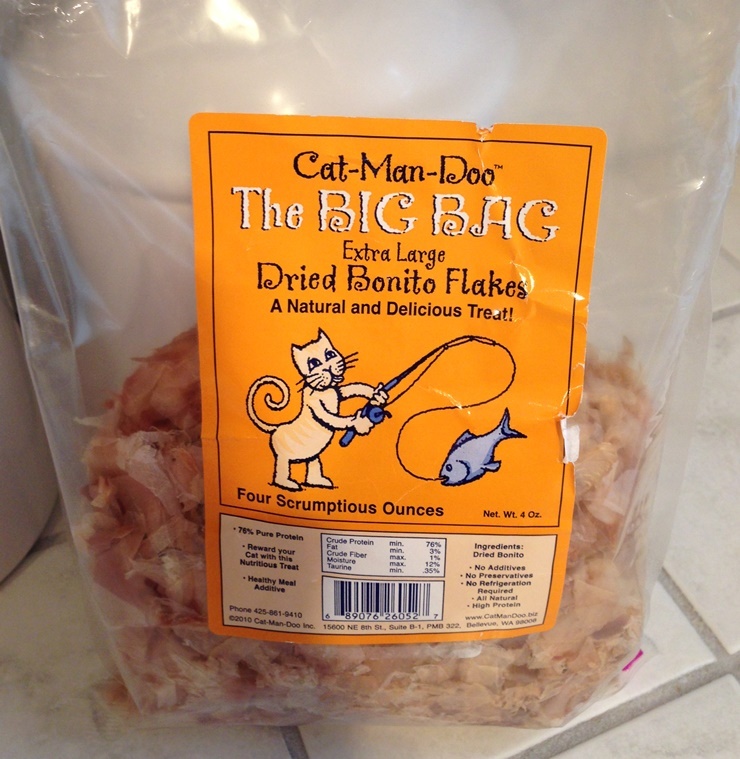 Tagged: cat food, cat treats, Cat-Man-Doo, Dried Bonito Flakes, Nessa, Teagan. You can follow any responses to this entry through the RSS 2.0 feed. You can leave a response, or trackback from your own site. We have one cat and give her the elevated pH water we drink (filtered from the sink), dry cat food for older cats and tuna or chicken marketed for human consumption from cans. We don’t eat this tuna or chicken ourselves and she only gets part of each can at a time to make sure she wants to eat it. The rest is placed in the refrigerator for later. She seems to like it. 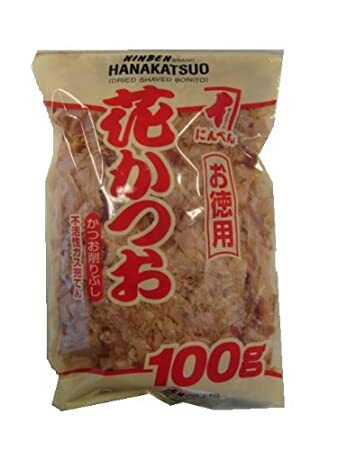 My cats won’t eat food (I only give them cat food) after it has been in the refrigerator. So I have to buy LITTLE cans or tubs so they eat it all. I am just seeing this now, after your text. I pay $18 for four ounces! I will try giving it to her and see what she thinks. Thank you so much for offering to pick me up a bag. Thanks for thinking of us!